Our sixth Songscape was held at Roosevelt National Forest in Colorado with The Burroughs! This was our first partnership with the US Forest Service, as well as our first time featuring soul music. The Burroughs created a song inspired by the forest, alongside a music video which shows off the landscape that spurred their creativity. Through the band’s infectious joy in Step Into the Music, this Songscape generates new fans for public lands, and celebrates one of the most beautiful places on earth. Let's make sure Roosevelt National Forest belongs to the people forever! Roosevelt National Forest in Dark Green. Roosevelt National Forest, managed by the US Forest Service alongside Arapaho National Forest and the Pawnee National Grassland, is an 800,000 acre wonderland, receiving more recreational visitors than any other National Forest! The forest rises from the dry foothills of the Great Plains all the way to snow covered peaks that pierce the sky. The Burroughs are the lucky band that enjoyed all the National Forest has to offer. Based in Greeley, Colorado, the band has been getting people up and dancing across the state. "Steeped in classic soul standards and outfitted with modern flair, The Burroughs are a nine piece band with a powerhouse sound that has been electrifying audiences across Colorado and beyond. Since 2013, the band has lit up stages with their trademark brand of “Sweaty Soul Music,” quickly earning their rightful place as one of the best live bands in the region". From June 30 thru July 4, the band stayed at Colorado State University's Mountain Campus. Surrounded by the National Forest in a beautiful, secluded mountain valley at an elevation of 9,000 ft., the 1600 acre campus hosts the Colorado State University community and surrounding region for academic field studies, educationally focused conferences and mountain research. Sustain's co-founder, Betsy Mortensen, spent a month up there as part of her course work for her B.S. in Wildlife Biology, and was eager to share this magical place with The Burroughs. Tobias of Cloverlick Banjo Shop with the Songscape drum. Following a kick off party on June 30th, the band spent nearly a week hiking, fishing, birding, stargazing, and relaxing in Roosevelt National Forest. Master naturalists and expert outdoor recreationists from the USFS, National Forest Foundation, and Poudre Wilderness Volunteers immersed the band in all the forest had to offer. Videographer Jason van Fleet of Iconic Digital Studios documented everything to create the music video. 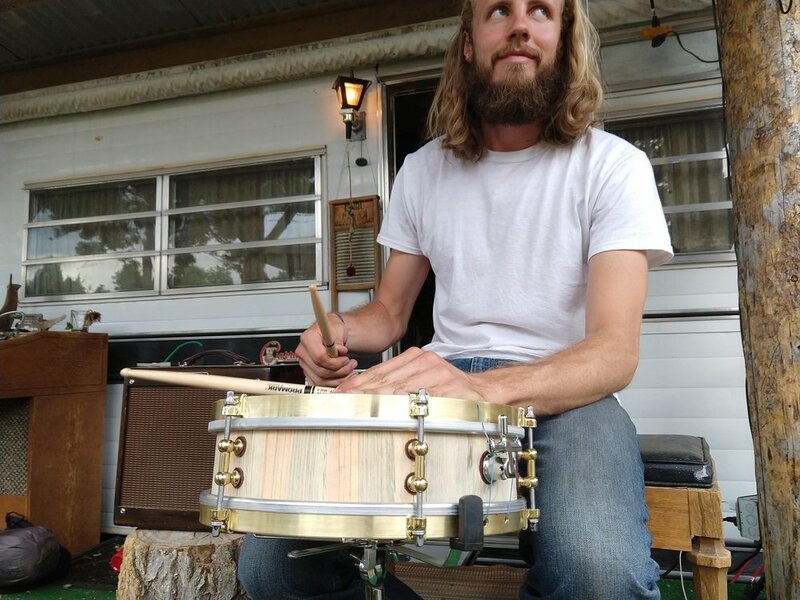 We also partnered with Cloverlick Banjo Shop who created a drum for the band from locally-sourced ponderosa pine, collected at the Ben Delatour Scout Ranch! The Burroughs composed their Songscape song shortly after their stay in the National Forest and recorded it at Aims Community College with Colin Bricker as engineer. The song was released on National Public Lands Day- September 22, 2018. Music video out on Sept. 29th! Join us in Fort Collins at New Belgium Brewery (Sept. 29, 2-4pm) for our first ever Songscape concert and the video premiere! Not only are we generating new fans for Roosevelt National Forest through the emotional power of music, but we're also supporting the forest's stewardship. Proceeds from the Songscape song will support the band, Sustain and the Poudre Wilderness Volunteers for 5 years! The US Forest Service manages and protects 154 national forests and 20 grasslands in 43 states and Puerto Rico. The agency’s mission is to sustain the health, diversity, and productivity of the nation’s forests and grasslands to meet the needs of present and future generations. Colorado State University’s Mountain Campus is a unique and special place that serves critical educational and research purposes. For more than 100 years, students have forged deep connections to the campus while immersing themselves in the environments they study. Today, the Mountain Campus serves a broad swath of ages, imparting environmental science to new generations of scientists, conservationists, and citizens. Located at 9,000 feet and surrounded by Roosevelt National Forest, the campus is open from Mid-May to Mid-October. As the nonprofit partner of the U.S. Forest Service, the National Forest Foundation works with the agency and thousands of Americans each year to promote the health and public enjoyment of our 193-million-acre National Forest System. We believe that communities should play a leading role in determining the future of our National Forests and Grasslands, so we focus our efforts on connecting these communities, and the people who comprise them, to the tools, knowledge, and funding to become active and devoted stewards of this incredible public estate. We look forward to a future where all Americans know and care about our National Forests and Grasslands. Cloverlick Banjo Shop, one of our Green Roster luthiers, is an artisan banjo shop that makes heirloom quality banjos by hand in Fort Collins, CO. They are dedicated to building community, respecting the environment and supporting music. Sustain is grateful to have their support and enthusiasm for this Songscape, as well as the incredible drum they're creating for The Burroughs to play in Roosevelt National Forest. The drum is made of beetle-killed Ponderosa Pine collected and milled at the Ben Delatour Scout Ranch, just a few valleys over from where the Songscape will be taking place. Colorado State University’s Warner College of Natural Resources supported this Songscape not only financially, but educationally! Our co-founder, Betsy Mortensen, received her degree in Fish, Wildlife, and Conservation Biology from Warner College in 2010, and well prepared her for a life in conservation. As part of the coursework, she spent a month at the closely linked Mountain Campus. This Songscape wouldn’t have happened without the knowledge and experience gained at the Warner College of Natural Resources, or their donation! Thank you Warner Rams! New Belgium was a stellar supporter of this Songscape project. Besides donating beer to fuel an amazing Songscape retreat, they also generously donated the first ever public Songscape release party. The Burroughs were able to put on a two hour show for over 300 people, and we premiered the Songscape music video on the big screen at the Fort Collins, CO headquarters for New Belgium. Without New Belgium’s dedication to public lands, sustainability and Sustain, this Songscape couldn’t have happened! They even brewed a special Burroughs Bourbon Ale for the occasion! Thanks New Belgium! In 1897, C.C. Filson opened C.C. Filson's Pioneer Alaska Clothing and Blanket Manufacturers, specializing in goods to outfit the stampeders to the Klondike Gold Rush. He owned his own mill and manufactured Mackinaw Wool clothing and blankets, knit goods, as well as selling boots, shoes, moccasins and sleeping bags specially designed for the frigid North. Filson kept in close contact with his customers, improving his goods to meet their specific needs. The stampeders depended on Filson. In that era, clothing wasn't a matter of choice, but of survival. Filson's name became synonymous with reliability, satisfaction and honest values. By the 1960s, Filson's reputation as the premier outfitter for outdoorsmen had spread around the globe. Sustain is very fortunate to outfit The Burroughs in Filson shirts as they brave the alpine mountains of Roosevelt National Forest! PLUS you can get your own Filson bag at our silent auction at the New Belgium party on Sept. 29! Thank you Filson! Supporting Sustain for a second Songscape! Look out for some sweet KUHL gear at the Songscape Release Party in September, and you might go home with it! Colorado-born Topo Designs has donated some great goods to help support Sustain! Check it out at New Belgium on Sept. 29 from 2-4pm during The Burrough’s concert and your bid will help support Songscapes! Thank you Topo! AfterShokz have donated two Trekz Titanium bone-conduction headphones to support this Songscape. We tried them out at Outdoor Retailer and I don't want to go back to regular headphones.